The mean, median, mode, standard deviation, and coefficient of variation of the marketing period for the selected or specified population, or for the combined marketing period subcategories. The calculated DLOM and range of DLOM outcomes. Tables that support the graphs. The mean, median, mode, standard deviation, and coefficient of variation measured using 50-day, 100-day, 250-day, and 500-day price look-back periods ending with the valuation date specified by the user. The mean, median, mode, standard deviation, and coefficient of variation measured using a look-back period specified by the user. This calculator provides DLOM using the combined probabilities of marketing periods and price volatility. This estimator provides DLOM using the combined probabilities of marketing periods and price volatility. Select a value for each, or any combination, of the 14 drop-downs of subcategories of the population of marketing period transactions (SIC, NAICS, State or Region of Business, Valuation Month, Valuation Year, Asking Price, Number of Employees, Years in Business, Annual Revenue, Gross Profit, Operating Profit, Earnings before Taxes, Total Assets, Stockholders’ Equity). Alternatively, you can specify a mean and standard deviation for the population or any or all of the 14 factors. Additionally, specify a price volatility mean and standard deviation or provide the stock ticker symbol for up to 20 guideline companies. Alternatively, you can specify a mean and standard deviation for price volatility. The mean, median, mode, standard deviation, and coefficient of variation of the marketing period for our transaction population or for a specified population. The mean, median, mode, standard deviation, and coefficient of variation of the combination of selected marketing periods using our dropdown choices or for the combination of specified marketing period subcategories. The mean, median, mode, standard deviation, and coefficient of variation of price volatility of the separate and combined guideline companies measured using 50-day, 100-day, 250-day, and 500-day price look-back periods ending with the valuation date specified by the user. The mean, median, mode, standard deviation, and coefficient of variation of price volatility measured using a look-back period specified by the user. 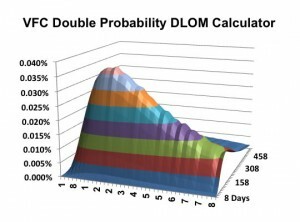 The calculated DLOM and the range of DLOM outcomes.